Technical Support for the Deployment of Sensors during HeliSnow 2008. ESA Study, Prime Contractor ENVEO, Contract 21146/07/NL/FF. HeliSnow-2008 is aimed at the acquisition of experimental backscatter data of snow and ice over various background targets. The main motivation is the need for Ku- and X-band backscatter data sets for geophysical retrieval algorithm development in context of the COld REgions Hydrology High Resolution Observatory (CoRe-H2O) mission. 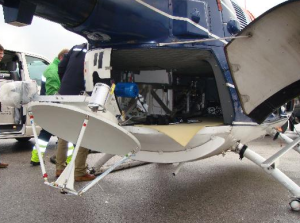 During winter 2007/2008 two measurement campaigns (13-19 December, 13-15 January) were carried out with a helicopter based scatterometer system (MultiScat) developed and operated by the University of Hamburg. The MultiScat system measures the polarimetric backscatter data at L-, S-, C-, X- and Ku-band frequencies. The helicopter based Multi3Scat system measures polarimetric backscatter data at 5 frequencies. During the MultiScat acquisitions measurements of the physical snow and ground properties are carried out.